This exhibition features three of WAM's best ancient Greek vases: a neck-amphora by the Painter of the Munich Atalante featuring the hero Herakles (1966.63); a stamnos by the the Tyszkiewicz Painter showing the mortal Peleus capturing the sea nymph Thetis (1953.92); and a lekythos by the Achilles Painter depicting two women carrying offerings for the dead (1900.65). Each vase, made in Athens over 2,500 years ago, illustrates one of the major vase-painting techniques: red-figure, black-figure and white ground. The ingenious firing methods the potters used to produce their distinctive red and black colors mark a milestone in the history of ceramic technology that scientists were only able to reproduce in the 20th century. Prior to the opening of the Idea Lab exhibition, WAM conservators restored the three vases and made exciting discoveries in the process. During work on the red-figure stamnos (a vessel for storing and mixing wine and water), they applied cutting-edge scientific technology to unlock the mystery of how vase painters created relief lines, slightly raised lines that were used to outline figures and render details, such as mouths, hair, musculature, and drapery folds. Scholars had long believed that these lines were extruded from a syringe-like instrument, as when a baker squeezes icing for cake decoration, but conservators' experiments suggest that relief lines instead were produced with a brush made of only a few hairs that was used in two different ways to produce two types of lines: one with a characteristic ridged profile, and one with a furrowed profile. The conservators made yet another discovery as they worked on the lekythos, a container for oil probably used in the preparation of the dead for burial or as an offering at a tomb. 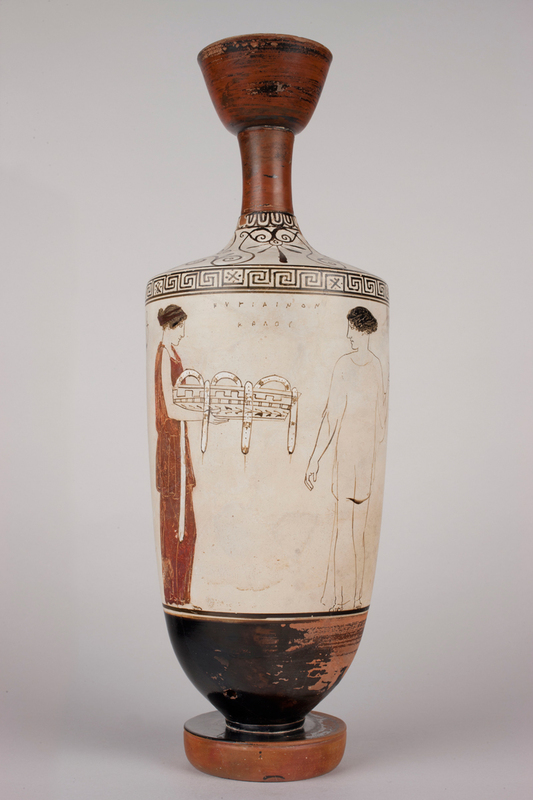 When they disassembled the lekythos during treatment they found a small vessel hidden within the neck of the vase. This small container gave the appearance that the vase was full, when, in fact, it held only a token amount of the precious oil.